Our new abrasive technology quickly removes stubborn oxidation, stains, bird dropping blemishes and other sub-surface defects while polishing the surface to a mirror finish. Unlike traditional rubbing and polishing compounds that scour the surface, our new clear coat safe micro-abrasives produce an amazingly clear finish that is free from scratches, hazing and swirls. 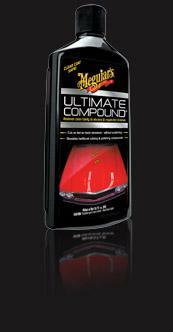 Whether working by hand or with our DA polisher, Ultimate Compound is the perfect choice to prepare your paint’s surface for your favourite Meguiar’s wax. Safely removes paint defects such as oxidation, scratches, water spots and blemishes. Dramatically reduces the time and effort required to restore a neglected paint finish.